Can you believe the summer is almost gone! This has been another very busy week for CASE! CASE authored a letter to Assistant Secretary Michael Yudin, Office of Special Education and Rehabilitation Services in response to a letter by the Consortium for Citizens with Disabilities sent on June 30, 2015. We have heard from many of our members and we have always believed it is better to be descriptive of educational needs as opposed to labeling with specific diagnoses. To read the letter from CCD, click here. To read the CASE response, click here. We were pleased to have the National School Boards Association, AASA, National Association of State Directors or Special Education, Association of Educational Service Agencies, Learning Disabilities Association of America, National Association of School Psychologists, National Education Association, and the National Rural Education Association all join in as signatories on our letter. We will keep you informed on any follow up we receive. Speaking of taking action... The National School Boards Association is filing an amicus brief in a case that has potential implications for the personal legal liability of mandatory reporters of child abuse. As you know, all states require most, if not all, school personnel to report known or suspected child abuse to the proper authorities. To encourage timely reporting, these laws provide immunity from civil and criminal liability in connection with making a good faith report. The U.S. Court of Appeals for the Sixth Circuit in a case called Wenk v. O'Reilly has recently held that a school administrator is not entitled to qualified immunity from a claim of First Amendment retaliation brought by the parent named in the report as the suspected abuser. The parent brought the claim in federal court, asserting that the administrator had filed the report in retaliation for his forceful advocacy for his daughter who received special education services from the district. The Sixth Circuit ruled that mandatory reporters are not shielded from such claims and may be held personally liable if there is any evidence of retaliation even though the reporter has reasonable grounds to suspect abuse and is required to notify proper authorities under state law. In other words, a mandatory reporter acting in compliance with state law may be sued in federal court by the suspected abuser. The school administrator in the case is seeking review by the U.S. Supreme Court. NSBA plans to argue that the High Court's review and reversal of the decision made by the Sixth Circuit Court of Appeals is critical to maintaining the important role school personnel play in reporting suspected child abuse. State law immunity exists precisely to protect mandatory reporters who act in good faith when reasonable grounds exist to suspect abuse, regardless of whether the report results in substantiated findings by child protective services or law enforcement agencies of abuse. There are many other education associations joining NSBA; along with CASE, we know of NASP, and NASDSE. We know students with disabilities share a higher percentage of abuse than the general population and any deterrent to the mandatory reporting protection will hurt our most vulnerable citizens! And yet another opportunity! With the fall seems to always come one more opportunity to plead with Congress to take care of Sequestration! CASE has been signing on to the NDD United Coalition's letters to Congress from the very first one. Many of our subdivisions have also signed on to the letter and encouraged other state organizations to do so. I have sent out that call for the newest letter this past week so make sure your subdivision and other state associations follow through on signing the letter! It is not for individuals, only for associations but you as an individual can and should contact your representatives and Senators and tell them to "fix" sequestration! With your Congressional delegation home on recess, now is the perfect time to talk to them about Sequestration. Invite them to your schools to see your programs/students/teachers if you are already back in school ... if not, maybe you could have an "event" at your schools and bring some of the students in. It is always harder to cut funds when there are faces attached to them! Last Week's Poll asked, "Which of these political issues are impacting you the most now or you anticipate they will in the future?" 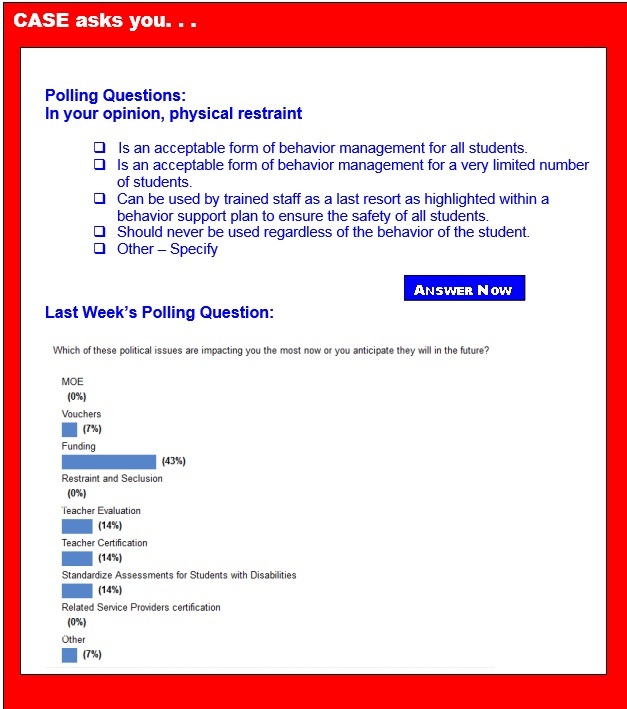 and of those answering the poll, 43 percent said Restraint and Seclusion. There was a three way tie at 14 percent between Teacher Certification, Related Service Providers certification, and Standardized Assessment for students with disabilities. Funding came in at just 7 percent! Are you surprised at these numbers? We would love to hear what solutions you would like CASE to work towards in these areas! Contact Our policy and legislative chair, Phyllis Wolfram or me with your issues and solutions! PS ... Remember, CASE has a great Lucky 21 on Restraint and Seclusion that is especially helpful in explaining the issues to Board members, superintendents, principals, etc! House Education and the Workforce Committee Chairman John Kline, R-Minn., Senate Health, Education, Labor and Pensions Committee Chairman Lamar Alexander, R-Tenn., Senate Ranking Member Patty Murray, D-Wash., and House Ranking Member Bobby Scott, D-Va., met recently to discuss proceeding with a conference committee to resolve differences in the House- and Senate-passed bills to replace No Child Left Behind. OSERS recently announced a new funding opportunity, the Accessibility of Computers and Web Sites through an Automated Personalization Computing Project, to create the infrastructure we need to make it easier for any person of any age with any disability to more easily use any Web enabled device at school, at home, at work or in the community. "America leads on disability rights by example, but we must advance them internationally," says U.S. Secretary of State John Kerry, in The Americans with Disabilities Act Turns 25: Now We Must Work for Global Equality. Recently, the U.S. Senate passed a bipartisan resolution from U.S. Senators Orrin Hatch, R-Utah, and Patty Murray, D-Wash., to commemorate the 25th Anniversary of the Americans with Disabilities Act, which was signed into law on July 26, 1990. With the U.S. Congress entering it's August recess, the Policy Insider will be taking a brief summer vacation. The next issue of the Policy Insider will be Sept. 16. Transition is all the rage, and it should be. But what do you do with a kid who doesn't fit neatly into any of the categories? What do you do with any kid in fact? They're all individuals with different strengths and challenges. My daughter has multiple medical conditions, no physical disabilities, many learning difficulties and a PDD-NOS diagnosis, which puts her on the autism spectrum. She graduated from high school with a full diploma and spent two years in college before she decided it was just too hard and not clearly enough structured. So, what to do? U.S. Secretary of Education Arne Duncan may only have eighteen months left in office — but they're critical months when it comes to the reauthorization of the Elementary and Secondary Education Act. The House and Senate each passed bills that take aim at the Obama administration's K-12 priorities when it comes to teacher evaluation, standards and more. While the Republican-backed House bill was somewhat of a lost cause, the administration couldn't secure much of its ask-list in the Senate bill — particularly when it came to beefing up accountability — before it passed with big partisan support. Interesting new research finds that positive reinforcement is especially beneficial for children with attention deficit/hyperactivity disorder. Although it was known that praise improves the performance of children with ADHD on certain cognitive tasks, experts were unsure if the results were due to enhanced motivation or because ADHD kids had greater room for improvement. University of Buffalo researchers discovered a little recognition for a job well done means a lot to children with ADHD, more so than it would for typically developing kids. What's keeping administrative license holders from becoming school leaders? Reports of the shortage of applicants for school leadership positions are well-known. The authors of "Churn: The High Cost of Principal Turnover" say a quarter of the country's principals will leave their schools each year, and nearly 50 percent will leave in the third year. Missing from the reports is an analysis of why individuals who already hold an administrative license are not applying for vacant principal positions. A new study published in Pediatrics has found an association between eating habits and neurological conditions. The researchers, who interviewed parents of 917 children ranging in age from two to six over the course of three years, found a connection between moderate selective eating — indicative of those choosy eaters we mentioned — and symptoms of conditions including anxiety, depression, and ADHD. Children who exhibited severe selective eating — such strict food preferences they have trouble eating away from home — were found to be seven times more likely to be diagnosed with social anxiety, and twice as likely to become depressed. Facial motion capture — the same technology used to develop realistic computer graphics in video games and movies — has been used to identify differences between children with childhood apraxia of speech and those with other types of speech disorders, finds a new study. "Inclusion" is defined as the practice of educating all children in the same classroom, including children with physical, mental and developmental disabilities. IDEA (or the Individuals with Disabilities Education Act) mandates that special education students receive a free and appropriate education from the ages of 3 to 21, depending upon the state interpretation of the policy. In 1975, IDEA mandated that special education students be placed in their least restrictive environment. But that's difficult to do with limited resources and budgets. That is, until digital technology swept into schools. The two boys at Harmony Road Music School banged on the drums, shook rain sticks and rattles, and tried to pick out tunes on the piano. If it didn't resemble a typical music lesson, that's because it wasn't. Instructor Madison Whelan's musical games were meant to help the students develop skills that can be used outside of music, such as impulse control and communication. "They don't know they're working on anything other than just playing for fun," Whelan said recently.